A team from the UNSW Sydney Wild Deserts project made the unexpected discovery during recent scientific monitoring. 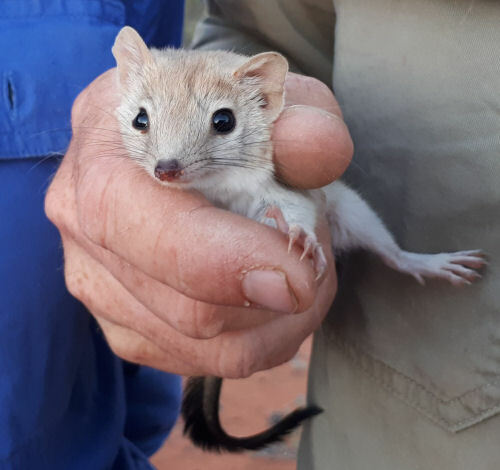 UNSW scientist and Wild Deserts ecologist Dr Rebecca West, said it was particularly exciting to find a Crest-tailed Mulgara alive for the first time in NSW. 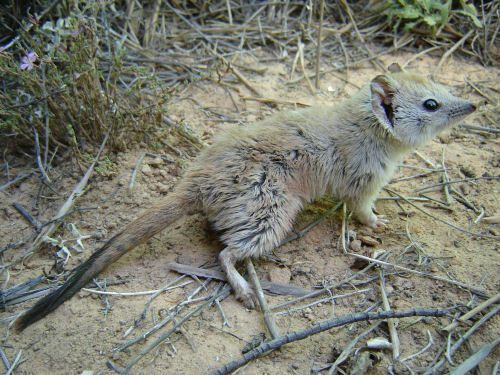 “The Crest-tailed Mulgara was once widely distributed across sandy desert environments in inland Australia, but declined due to the effects of rabbits, cats and foxes. “The species weighs around 150 grams and has pale blonde fur and a thick tail with a distinctive black crest,” Dr West said. "The discovery comes at a great time," said UNSW scientist and Wild Deserts project co-ordinator Reece Pedler. “Next year we are due to begin introduced predator and rabbit eradication from a large area, which will no doubt help the Mulgara,” Mr Pedler said. “The Wild Deserts project is contributing to the NSW Government’s Saving our Species conservation program (SOS),” said National Parks and wildlife Service area manager Jaymie Norris. “The aim of this project is to return mammal species not seen in their natural habitat for over 90 years in Sturt National Park. “Rabbits, cats and foxes will be eradicated from two 20-square-kilometre fenced exclosures in Sturt National Park, before locally extinct mammals are reintroduced." "Reintroduced native mammal species will include greater bilby, burrowing bettong, western quoll and western barred bandicoot,” Mr Norris said. The Wild Deserts project is a partnership between UNSW and Ecological Horizons, in collaboration with Taronga Conservation Society Australia. Wild Deserts has been contracted by the NSW Office of Environment and Heritage to restore and promote desert ecosystems in Sturt National Park. Previous work in South Australia by Wild Deserts team members suggests that the Crest-tailed Mulgara has been recovering in numbers and expanding its range. Reduced rabbit populations during the last 20 years due to release of rabbit calicivirus is thought to have benefited the species by leading to increases in ground cover. Reductions in populations of introduced predators such as cats and foxes has also increased the numbers of small rodents for Mulgara to prey on. In recent years, Crest-tailed Mulgara have expanded their distribution in the Strzelecki Desert over the border in South Australia.